Sally is a talented handstand balancer. Her natural ability to bend herself in half and effortlessly balance on one hand or two has left audiences worldwide amazed. Sally has an excellent technical ability arising from her strong gymnastics background. 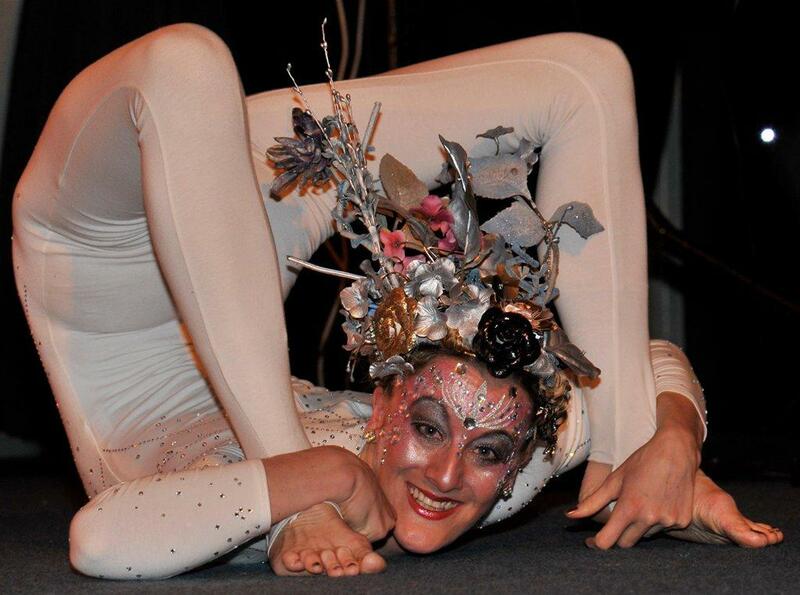 She combines this with artistic creativity and an exciting stage presence to add something special to any event. Sally spent thirteen years training and competing in artistic gymnastics to a high level. She then trained in sports acrobatics and tumbling, competing nationally. Since then, she has performed across the UK and internationally as a handstand balancer and contortionist, and with her aerial acts on the aerial hoop and static trapeze. She has previously worked at corporate events, festivals, theatre, cabarets, and has appeared on the television and in publications. Ceiling height needs to be a minimum of 3m for taller canes and 2.5m for small canes. The choreographed acts last approximately 5.5 minutes and the ambient background performances are up to 4 x 10-15 minutes sets. She was great! Please thank her for being such a pleasure to work with. Sally was great! The guests were completely wowed. Plus she was just generally lovely to work with. The event went really well and Sally was fantastic. Please let Sally know that we had brilliant feedback about her performance. Please pass on our thanks to Sally once again. Sally was AMAZING!!! !… Everyone was very impressed and Sally is so lovely to work with…Thank you and thank you Sally!